Two Harvard pediatricians discovered that their young patients who enjoyed popsicles also got atrophy or shrinking of their cheek fat. 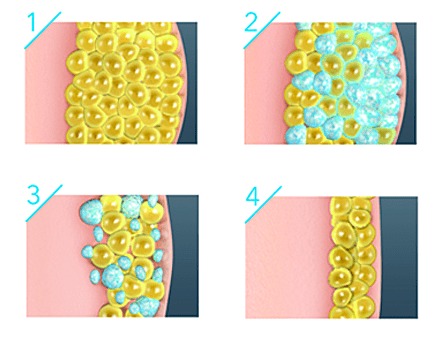 Coolsculpting works by cooling the desired fatty area down to just above freezing, a temperature that does not harm other tissues, but gradually kills fat cells. Each area takes 30 to 45 minutes to treat. There is no pain, disability, or downtime. Areas commonly treated are the double chin, back, abdomen, love handles, and muffin top. It's an innovative way to contour your body by freezing unwanted fat away with no surgery and little to no downtime. With more than 6 million CoolSculpting® treatments performed worldwide, people everywhere are getting a better view of themselves, thanks to the one-of-a-kind CoolSculpting®procedure. "Always excellent! Love Dr. Jones and his entire staff. Not only are they professional, they make the whole experience fun. I have been going to Dr. Jones for years and will continue for many more years :)"
"Dr. Jones and his staff are very knowledgeable and made me feel very welcome and comfortable. I'm excited to continue my journey with this team!" "I had cool sculpting done on my double chin with Taylor. She was professional and knowledgeable. Becky was wonderful, too. Great atmosphere and would highly recommend."